Denby Park properties to be purchased by City of Norfolk. RED highlighted properties are to be purchased in 2013. 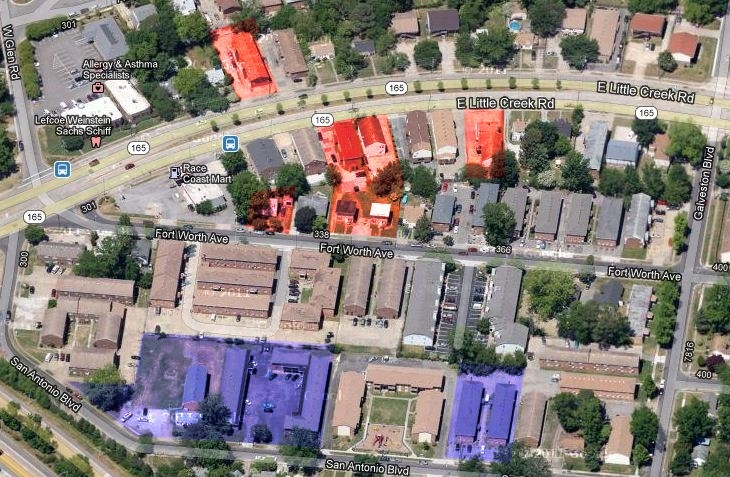 BLUE highlighted properties were purchased in 2011. City Council will be voting on January 29, 2013 on the second round of derelict property purchases in the Denby Park neighborhood. The addresses of the properties to be purchases are: 308 E. Little Creek Road, 317 E. Little Creek Road, 319 E. Little Creek Road, 325 E. Little Creek Road, 328 Fort Worth Ave, 334 Fort Worth Ave, and 338 Fort Worth Ave. These 2013 purchases are in addition to the properties on San Antonio Boulevard which were purchased in 2011 and eventually torn down. These purchases are in accordance with the 2004 Wards Corner Comprehensive plan. NORFOLK –The City of Norfolk has reached agreements to purchase seven properties located in the 300 blocks of Fort Worth Avenue and East Little Creek Road in the Denby Park section of the city. These acquisitions further the Greater Wards Corner Neighborhood Plan and the city’s ongoing efforts to foster safe and healthy neighborhoods which will sustain future generations. The agreements include the acquisition of 37 apartments on seven properties for $1.45 million. City Council will vote on the purchase and sale agreements during the Council session scheduled for Tuesday, January 29, 2013. The property owners are working with their tenants to relocate them. Once the properties are vacant, the city will conduct an environmental impact study then the apartments will be demolished. In August 2011, the City of Norfolk purchased 68 apartment units on seven properties in the 300 block of San Antonio Boulevard for $2.68 million. Those apartments were demolished in April 2012. The city is working with the community to determine the best use for the open space. This entry was posted on Tuesday, January 29th, 2013 at 12:33 pm and is filed under blight, City Of Norfolk, Wards Corner Crime. You can follow any responses to this entry through the RSS 2.0 feed. Both comments and pings are currently closed. Thank you for persevering in the redevelopment and revitalization and renewal of Wards Corner after 12-15 years of meetings, plans and citizen loyalty. Thank you to our Council reps and to our City Manager. Carter Melin on Maury, Norview, and Granby among best high schools in the country! Warren W. Spencer on Maury, Norview, and Granby among best high schools in the country! ND on More retail coming to Wards Corner! MN on More retail coming to Wards Corner! Wards Corner on More retail coming to Wards Corner!